Ensemble Hye commissioned Songs of the Double Moon and will premiere the work at the IPAC Hall in Seoul, South Korea on May 18, 2019. The composition is scored for flute, violin, cello, and piano, four hands. There is a second version of the piece which is scored for flute, violin, cello, piano, and xylophone. Ensemble Hye will premiere the version with the piano, four hands. 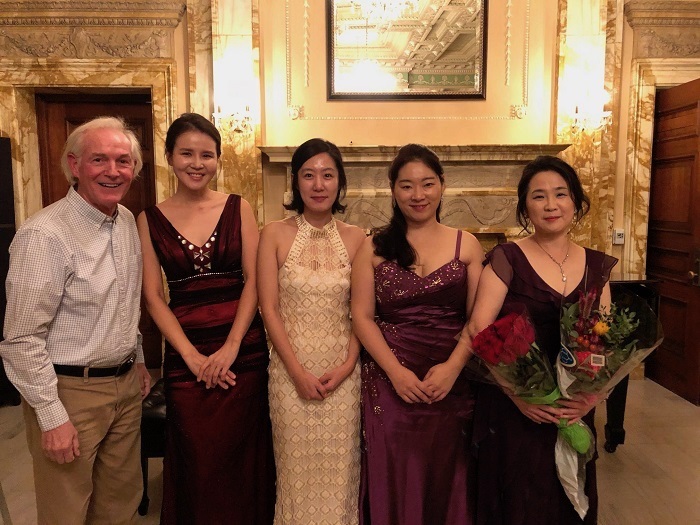 Pictured with the composer are Enesmble Hye members from left to right - Sunha Lee (viola), Jooyeon Song (flute), Hye Young Kim (piano), and Suhyoung Park (piano). Songs of the Double Moon was commissioned by Hye Young Kim and Suhyoung Park for their group Ensemble HYE. The ruling planets of the zodiac signs associated with the birth dates of Hye Young and Suhyoung are Mars and Moon. In August of 2018 when I was composing this work, the Earth passed between the sun and Mars around the time Mars was closest to the sun. This caused Mars to be bright in the sky alongside the moon creating the illusion of a double moon. The music uses the Moon and Mars for its inspiration and structure. The composition has three parts and opens with variations on the Korean folk song Ganggangsullae, “Dance Under the Full Moon”. The second part features five themes whose durations come from the Magic Square of Mars. The themes are “Moon Walk”, “Suhyoung’s Soul” - created by feng shui being applied to Suhyoung’s birth date, “Hye Young’s Hip Hop” - created by feng shui being applied to Hye Young’s birth date, “Moon Meditation”, and “Mars Madness” - patterns derived from the Magic Square of Mars. The final part is a union of the Moon and Mars in a section called “Galaxy Rock”. Blair/Mertens Duo perform Right at the Dead End on Third Continent and in Fourth Country!